Although Presenter Notes can be used for a variety of purposes, they most often contain the statements intended to be spoken by the presenter. The following scripts demonstrate interesting uses of these written outlines. DO THIS ►DOWNLOAD the example presentation. 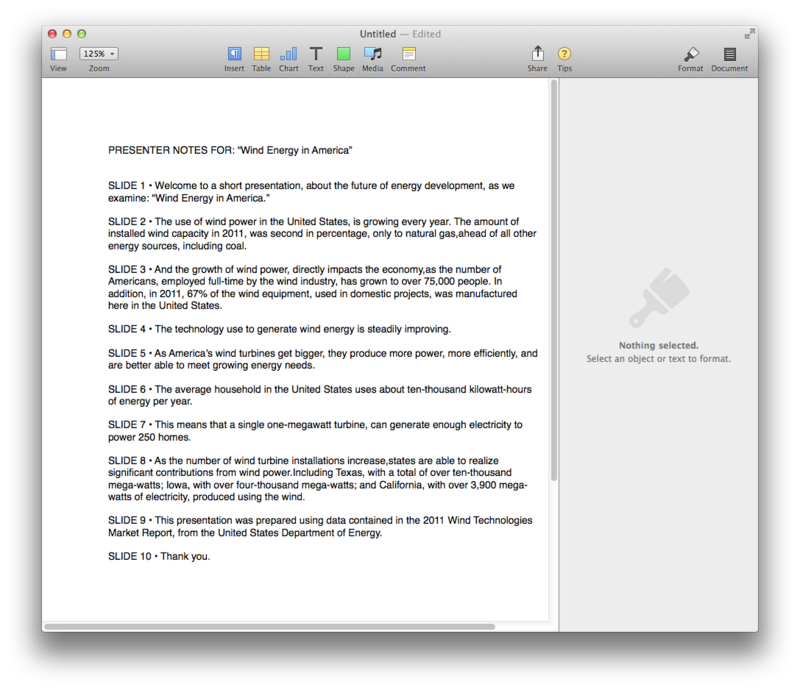 As many who develop presentations for a living will tell you, for a fresh perpective, it is often useful to work on presenter notes away from the presentation itself. The scripts in this segment demonstrate how to retrieve the presenter notes from a presentation and place them into a new document in another application like Pages or OmniOutliner. NOTE: OmniOutliner is productivity software from the Omni Group, and is available for purchase from the Mac App Store, or as a trial version from the Omni Group website. 28 set errorMessage to "No document is open." 30 set errorMessage to "No presentation is open." 33 "There are more rows in this document than there are active slides in the presentation." 36 "There are fewer rows in this document than there are active slides in the presentation." Here’s an interesting script that can provide an opportunity for you to sit back and watch and listen to your presentation being presented to you! This script uses the built-in text-to-speech capabilities of OS X, and the scriptable presentation controls in Keynote, to display each slide and read the slide’s presenter notes aloud. When a slide’s presenter notes have been read, the script will advance to the next slide. NOTE: This script is designed to work with presentations of a specific design. “Speakable” slides must not contain object builds and must contain presenter notes. 03 property stoppingStatement : "[[slnc 1000]] Stopping presentation." 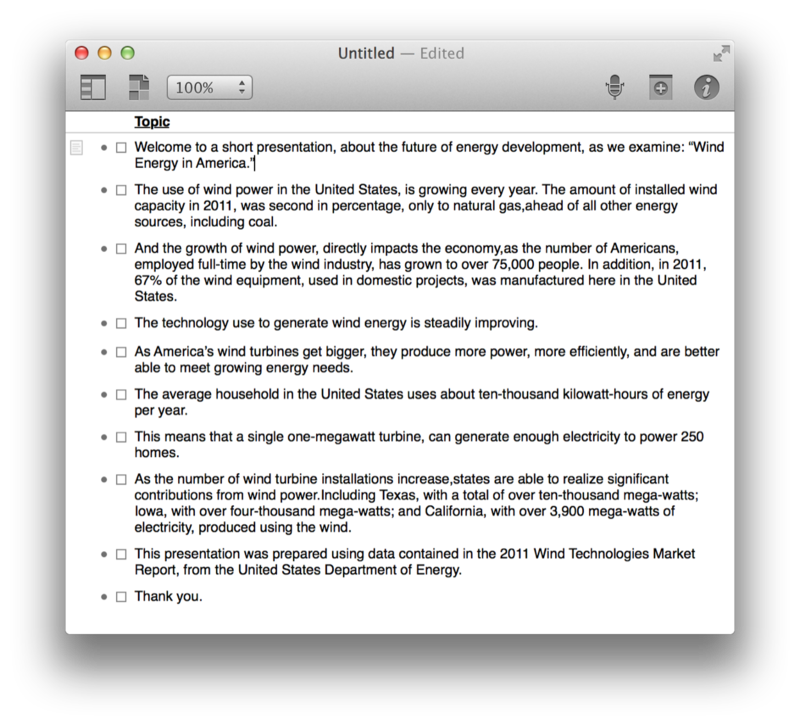 One more example of “spoken presentation notes.” This script will render the presenter notes of a slide to an audio file of the notes being spoken by the text-to-speech frameworks in OS X. The audio file is then imported into the source slide. Once the script has completed, you can play the presentation and advance the slides to listen to the presentation. TIP: Using the Export to HTML script, a presentation containing audio clips can be exported to HTML content, and placed on a server to become an online presentation! See for yourself! 36 "SLIDE-" & thisSlideNumber & "-" & thisTempName & ".aiff"
38 "SLIDE-" & thisSlideNumber & "-" & thisTempName & ".m4a"